It has been such a pleasure serving and getting to know all of you over these many years. I am retiring from my business effective December 20, 2016, to embark on my new career as a Certified Dietary Manager. I am leaving you in the capable hands of my dear and trusted friend, Garth Maijala. Garth and I have been business partners for 18 years, and he will be taking over for me in Santa Barbara County. He will offer you the same services that I have always provided for you. He has regularly scheduled classes and private groups can also be arranged. His company name is Fidelity Safety & Training LLC and they conduct training throughout California for private businesses, educational facilities, and governmental institutions. I’m sure you will appreciate his thorough training method sprinkled with wit and humor. I will miss all of you and greatly appreciate the support you have given me. Click here for food manager classes > >. 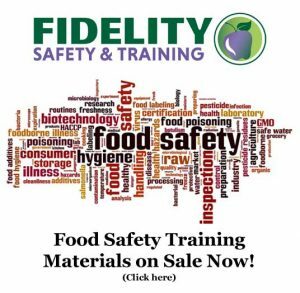 Click here for food handler card training > >.